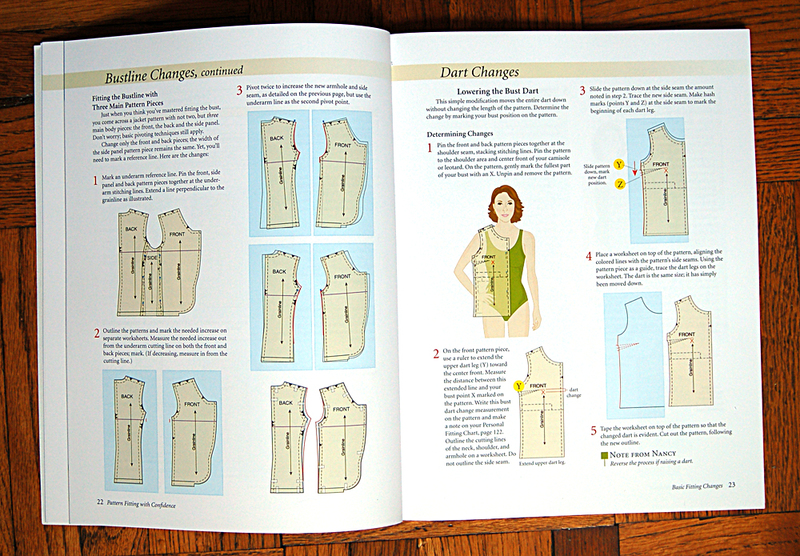 I promised to show you another book about fitting and alterations a while ago, and then we got so busy over the spring that all blog posts got pushed to the side for a while. But here it is, at long last. 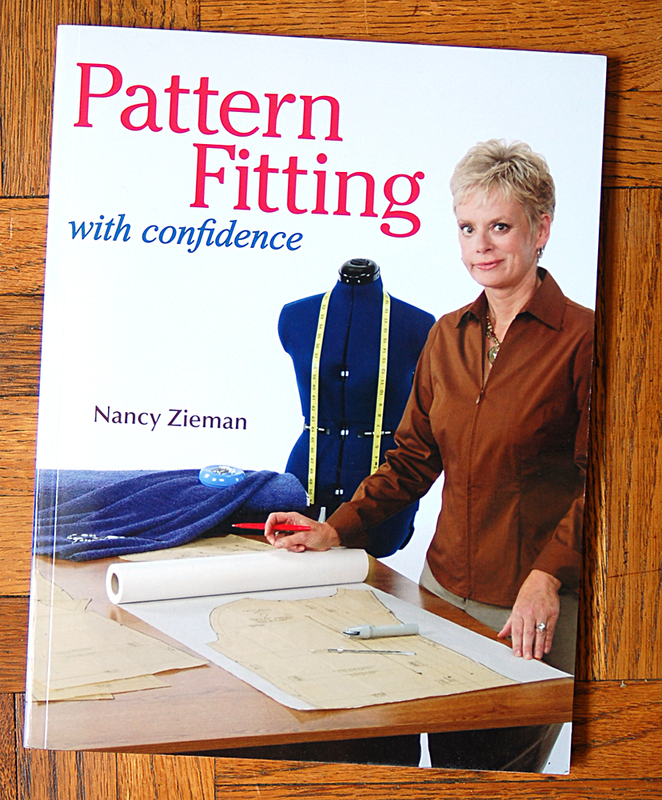 Pattern Fitting with Confidence is a Nancy Zieman book (you almost certainly know Nancy or have heard of her from her popular PBS show, “Sewing With Nancy“) published in 2009. You’ll notice right away that the inside of the book looks more contemporary and attractive than our previously reviewed favorite, Fit for Real People, with illustrations instead of photographs that look out-of-date quickly. Another advantage of using illustrations is that it can demonstrate the tell-tale signs of a poor fit more clearly than a photograph. Puckers and lines are very well-defined in the illustrations and can help you to identify where your own fit problems come from. Fit issues can sometime be deceiving, so it helps to have a guide like this to help establish whether the issue is–for example, broad shoulders or square shoulders. A good illustration can help to clarify the real source of the issue. This book takes a very different approach to fitting than Fit for Real People. I would describe it as a flat pattern approach that is similar to manipulations used in patternmaking. For each issue, a series of illustrations and instructions explain how to trace and adjust the pattern without altering the original pattern pieces themselves, giving you a new, adjusted pattern piece. You’ll still need to make a muslin in order to check the fit and probably to determine which adjustments need to be made before you begin to correct the pattern, but you won’t be altering your original pattern pieces. Instead, you make new, corrected pieces by trading and manipulating the original pattern pieces. I like the techniques used in this book and think it’s a very clear guide for making adjustments. This is a straight-forward method that can serve as a quick reference as well as a more in-depth workbook. Personally, I would probably use a combination of the techniques in this book with the more immediate (but messier and doesn’t preserve your original pattern) alterations in Fit for Real People. I would be curious to hear what your experiences with these books are. Have you tried either or both of them, and do you have a favorite? Has one technique worked better for you than another? Keep up the good work! I love your new patterns!! Hi, I can never figure fitting properly. Some of my angst is that most pattern have you overlock or zigzag seams, Where I much prefer french seams then topstitching. I really do whish more patterns would address french seams as once you have done it 20 or so times it is second nature. On another topic. Is there possibley any chance of Lissete coming out with Japanese inspired clothing ? I know it isn’t so much the tailored look af your gorgeous patterns. But there are a great many of us that would love to sew from japanese craft books But can not understand the patterns. Erica, fitting should generally be done before you start actual construction. It’s difficult to change French seams, so once you’ve taken care of any fitting issues (you can baste the seams together to check the fit, if necessary) you can proceed with construction confidently and not worry about alterations. Keep in mind, also, that French seams aren’t appropriate for all types of seams and fabrics. It’s a good idea to have a variety of seam finishing techniques you can use, depending on the type of seam and fabric you’re using. After you recommended the last fitting book I found it on Amazon for $2 and while I haven’t put anything into practice yet, I have been fascinated with reading it. I’ll try and find this one too and hopefully I can start sewing for myself this week. It’s been a long time of making things for other people and it’s my turn! Thanks for the great recommendations! I own Fitting for Real People. I hate the photos. The women look so exposed and the clothing has such a dowdy appearance. I think the book’s suggestion about “tissue fitting” is unrealistic. Commercial patterns from the big companies rip very easily. I read the first book you suggested Fit for Real People and sewed the basic pattern which gave me a good idea about my size. I read the second book you suggested, Pattern Fitting, and it shows how to alter a pattern for every fitting challenge too. The first book alters patterns differently than the second but I think they are both great resources to read and have on hand when I sew. I own both of these books. I got different help for each of them. As a petite Plus size woman, I have a difficult shape to dress. I call it the Perpetually Pregnant look, in that I have thin legs, a round tummy (I carry my weight where I carried my children) and a shallow chest. Plus, one bicep is 1 1/2 inches larger than the other! 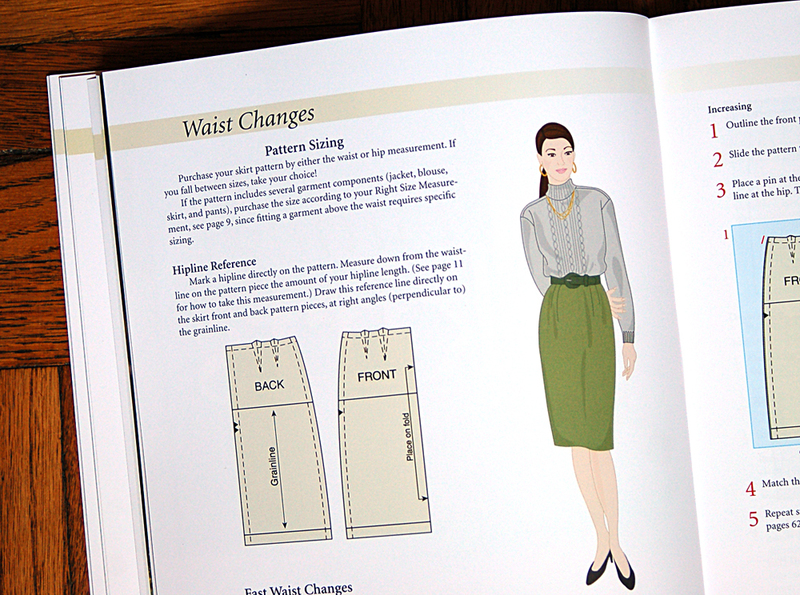 Nancy’s book is great if you have simple adjustments to make – her tip on enlarging sleeves was a God-send. However, it really didn’t help with the more difficult areas that cause me so much trouble. I found the Fit for Real People to do a better job. I also use Sewing for Plus Sizes, which is great and more clearly explains the problems encountered by larger women. I also use many of the Petite Plus patterns by Kathleen Cheethan, which are specifically designed for small, round women. Usually the only adjustment I have to make to those is the cup size, as she designs for D cups. I just spent two afternoons, one adjusting a basic shift dress pattern to accomodate my DD chest and the next afternoon finding out that my alterations that were followed to a “T” made the dress too big. I was following the directions from Fit For Real People and found the directions easy to follow and the concept easy to understand. I think I did not take into account the wear “ease” of the pattern, so my alterations were way too big. So…I heightened the darts, made another muslim form and again, no go. I am very frustrated and remember now why I quit sewing for myself. I would love to figure out this fitting issue. So today in frustration, I ordered Nancy Zeiman’s book as it looks a little bit easier to do. No cutting of expensive purchased patterns. This had better work. I’ll check back later. Had to buy a new pattern to start all over again. I have used her original pattern fitting book for years. I have been able to make stressn free garments and they always fit. I even sewed a wedding dress, by using the measurements given and altering the pattern via the slide and pivot and it fit the bride like a glove. One of the reasons people don’t enjoy fashion sewing (besides the fact you can’t find pretty fabric) is the garments don’t fit when finished. This book alleviates all the fear and your work will not be in vain.